Dr. Grauerholz is a Kansas native. He was raised in Kensington, KS, and grew up on the family farm. He was injured at age 14 in a farming accident and was brought to Salina for orthopaedic treatment for a complicated broken leg. 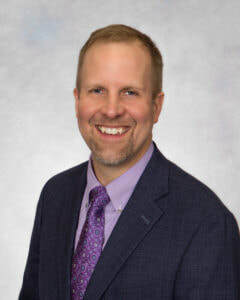 Dr. Kruckemyer was the orthopaedic surgeon who helped restore full function and inspired him to become an orthopaedist to help others in a similar way. In September 2007, Dr. Grauerholz joined Dr. Kruckemyer in his practice at the Orthopaedic Sports Health Clinic of Salina before he retired. Favorite hobby is wildlife photography.